Dating from the 18th century, Château Gayon is located in the heart of the Bordeaux wine country, on the Right Bank of the Garonne River near Langon. It is the home of the Crampes family, whose great-grandfather first had a lease on the vineyard in 1903. A hundred years later, the Crampes family is still there. Over the years, they succeeded in expanding their holding to 30 hectares of vines. The estate is presently managed by Jean Crampes. Château Gayon currently produces approximately 1,000 hectolitres of wine a year on clay-limestone soil in the Côtes de Bordeaux Saint Macaire and Bordeaux Supérieur appellations. This includes red, dry white, semi-sweet white, and rosé wine. Since 1903, the Crampes family’s fine wines, made with expertise and rigour, have won numerous medals at the most prestigious competitions in France and abroad. Château Gayon is produced sustainably and has Terra Vitis certification. It is a high-quality product that is marketed on this basis. For over 10 years, the Terra Vitis association has brought together winegrowers throughout France who share the same dedication to sustainable viticulture. By respecting regularly changing specifications and ensuring traceability of all operations in the vineyard and cellar, these winegrowers make sure to take into account all factors affecting the environment: the soil, the vines, the countryside, the fauna and flora, and the human element. They grow high-quality grapes using ecologically sustainable techniques in order to protect the environment and human health. Our wines are made traditionally, aged in stavewood oak barrels, and estate bottled. Château Gayon has an ultra-modern vat room and a cellar housing 200 barrels. The entire production (red Bordeaux Supérieur, dry white and semi-sweet Côtes de Bordeaux Saint Macaire, dry white Bordeaux, and Bordeaux rosé) is sold in bottle directly to clients in France and abroad. Above and beyond wine production, we also welcome visitors to the estate. 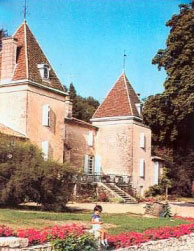 In order to do so, we decided to renovate one of the château outbuildings in 2000. This was a former bathhouse and rest area that we called gloriette. This free-standing building seemed the ideal location to welcome our clients and help them discover our wines under ideal conditions.